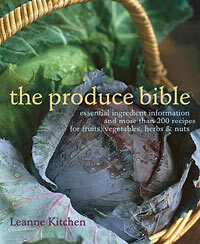 Written by Leanne Kitchen, The Produce Bible is a handy reference guide to fresh fruits and vegetables that will appeal to both gardeners and cooks. With each featured food there is a bit of history and lore followed by selection and storage information, varieties, preparation and culinary uses and 2-3 representative recipes. The content is organized into the 4 featured foods; Fruits, Nuts, Vegetables and Herbs and each is in turn broken down into food type, for example fruit is organized by citrus; soft; stone; tropical and vegetables by roots and tubers; stems and bulbs; flowers; leaves; fruit vegetables; seeds and pods and fungi. 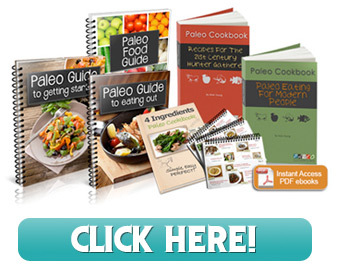 As much a cookbook as a guide, the recipes in the Produce Bible – more than 200 in all – include a selection of side dishes, meat and meat-free main dishes and desserts and offer a nice repertoire of traditional favorites – brussel sprouts with pancetta; pork chops with braised red cabbage; apple galette and sweet corn chowder – along with some fresh new ideas such as parsnip and leek puree; apple and passion fruit crumble; and plum and rosemary flatbread. The Produce Bible has a fresh, easy to follow design with some excellent photography of the fresh produce and many of the finished dishes. Whether you grow your own produce or frequent your local farmers markets this is a great guide to to follow along the seasons with.